OS X is renowned for its ability to configure peripheral devices automatically as soon as you connect them—usually all that is required is an Internet connection for downloading drivers and such. Thus, since I began using my Macbook, I have found that life really is has become so much easier without the need for all those installation CDs, or having to track down the product support page on some hardware manufacturer’s website. Such common annoyances that I endured regularly as a lowly ‘PC’ user are now a thing of the past. I just plug something in, the laptop asks me to install the drivers and then it just works. Most of the time. But sometimes, every now and then, something doesn’t immediately work just the way you expect it in OS X. And one of those things is the Creative Sound Blaster USB audio system. You see, I happen to like gramophone players. And I find it very convenient to be able to just plug in a USB cable and then just record and play records with superior audio quality. In other words, one of the main things I use the Sound Blaster for is to connect a gramophone player so that I can listen to vinyl records via a pair of separately connected active computer speakers. 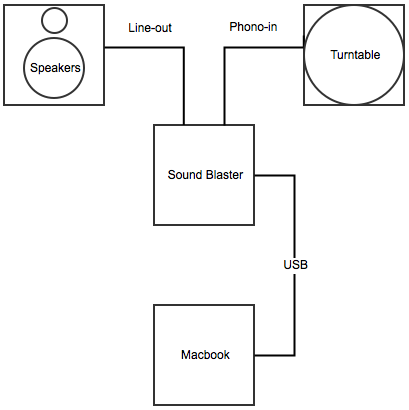 For an idea of my setup, see the following diagram. Looks fairly straightforward, doesn’t it? So you would expect that everything would work fine, once you go into the sound configuration menu in OS X and select ‘Embedded phonograph’ as ‘sound-input’ and ‘USB Sound Blaster HD’ as ‘sound-output’. Wouldn’t you? I know I would. Indeed, any reasonable sort of fellow would just start playing a vinyl record at this point and fully expect the vintage music to start pleasantly hissing and popping out the speakers. At least, this was my hindsightedly rather naive expectation. So when that didn’t happen, my initial surprise was rapidly succeeded by considerable disappointment, utter befuddlement and bitter frustration—in short order. Then I began searching the web for a solution, but found bupkis. Someone suggested that I try Jack for OS X, but I found this program to be overly complicated and (in spite of reading the manual and following the instructions) incapable of solving the problem. I am currently employing a temporary solution by using Audacity—a great free audio editor and recorder. Just start monitoring the right input source, and you can suddenly hear the music. I posted a hopefully bearably short video on youtube to demonstrate what I tried initially and how Audacity for reasons unknown to me just works. While I still have no idea why the records don’t just play normally in OS X, I think the fact that Audacity somehow does manage this is cause for optimism. I feel it’s just a matter of pinpointing what Audacity is doing exactly. Hopefully I will soon figure out what the problem is, but until then this provisional solution will do nicely. And of course I also hope this workaround might help someone else. But if anyone has a better suggestion or can point to something I forgot to try, then I’d love to read about it in the comments! I forgot to mention a crucial setting you have to apply in Audacity in order for this solution to work! You must enable the option ‘Software playthrough: Listen while recording or monitoring new track”. To do so, just select ‘preferences‘ in the menu and go to ‘recording‘. There, make sure that option is ticked and click on OK. Now start monitoring again as I demonstrate in the video and it should work! More importantly, I think I have found out what the problem is. 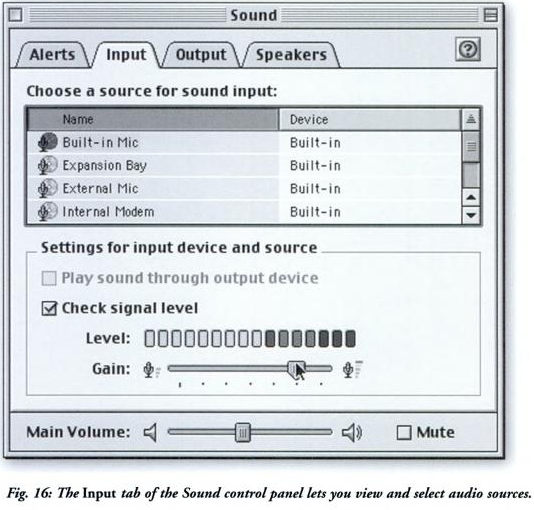 It would appear that Apple’s OS 9 used to have the option to ‘play input through audio device’. See also this picture of the OS 9 menu where that option may be selected. So apparently this option was removed in OS X. A great pity if you ask me. But I have discovered a simple small free program that is designed specifically to enable sound pass-through on OS X. It’s aptly called LineIn and appears to be actively maintained by its developer. Just select whatever input you like and whatever output you want and press the big ‘Pass Thru’ button. In other words, much easier to use than Audacity for this purpose. Here’s a screenshot. Problem solved.